Imagine happening upon an old book, one that, once you begin to turn the pages, sounds like a journal kept by a World War I soldier, one who was hurt and suffering and seemed on the verge of death. You notice that as you make your way through, you begin to feel weak, pained, as if you had been through a war yourself. The pain is unimaginable, and you have no idea from where it came. That terrifying scenario is the basis behind “Hypnagogia,” the excellent new record from Jersey-based doom metal stalwarts Evoken, their first new platter in six long years. This one is a concept piece, one that finds a WWI soldier on the brink of death but who makes a deal with a demigod that anyone who finds and reads his journal are doomed to face the same fate as he. Yeah, it’s a fantastical scenario, but we’ve been digging pretty deep into horror movies the past few weeks around here (it being the season and all), and this story sounds like something in which we’d immerse ourselves with a dark, strong beer with the lights out. As for the music itself, the band hasn’t lost their knack for slow, torturous, elegant doom metal that demands your utmost attention and rewards you handsomely. The band—vocalist/guitarist John Paradiso, guitarist Chris Molinari, bassist David Wagner, keyboard player Don Zaros, and drummer Vince Verkay—spread their horrors over eight tracks and 60 minutes on a record that’ll keep your bones chilled well into the winter. “The Fear After” starts the record, a 9:21-long masher that starts in a synth haze before opening gloriously, albeit darkly, with growls slithering and strings leaving a heavy glaze. Dark speaking spills the plot’s beginning, as keys drain, guitars chug, and great cries echo into the night. That turns toward anguish, with the growls paying off the pain, and the track paving the way toward “Valorous Consternation.” Here, the opening buzzes before guitars soar, and murky synth helps add a heavy cloud coverage. Growls crumble as the song tucks itself under cold waters, as speaking warbles, and then the track is shredded. The song begins to crush, while Paradiso howls, “To be the window into thy soul!” as riffs drizzle and then tangle before falling away. “Schadenfreude” is chilled and dark at the start, with Paradiso’s creaking speaking, gothy ambiance, and some damp chilliness. Synth drains as the song goes on a slow, tortured path, though sophisticated guitars glimmer for a while before they’re swallowed by infernal growls. Guitars bleed amid militaristic drumming before everything fades into mercy. “Too Feign Ebullience” is the second-longest song by eight seconds, clocking in at 10:03, and an instant roar works its way toward rushing waters and a frosty synth scape. An echoing dialog feels like a message in a dream, as the track sprawls and keys boil to give off some steam. Strings then arrive and sweep, while growls erupt, and the track comes to a devastating end. The title cut is an instrumental piece that starts with keys stretching before everything comes to life, gushing with emotional, heart-wrenching melodies. “Ceremony of Bleeding” has clean guitars and haunting keys at its front end, with growls arriving, and Paradiso wailing, “My soul, only a memory.” Cleaning singing then takes over, adding even more drama to the track, before guitars stretch out and sting, a charge is ignited, and utter savagery slams the door closed. “Hypnopompic” is another instrumental cut that has guitars charring, synth burning off, and the track gently easing to its finish before mammoth finale, “The Weald of Perished Men,” stretching over 10:11. We start slowly, as mournful speaking strikes and a sorrowful burst of melody brings a jolt. The power builds as the song goes on, as the band drubs away at you, and the guitars gash. “Please let me die,” Paradiso calls, “Let me go,” as synth washes over the song in waves, a strong buzz builds, and the pain and agony of the main character and all of his victims bleed into mystery. 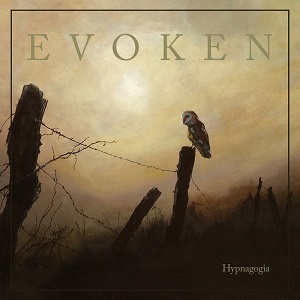 Evoken find new ways to spread their darkness on their sixth record “Hypnagogia” and weave that into this historical horror tale that would make for a spellbinding film. 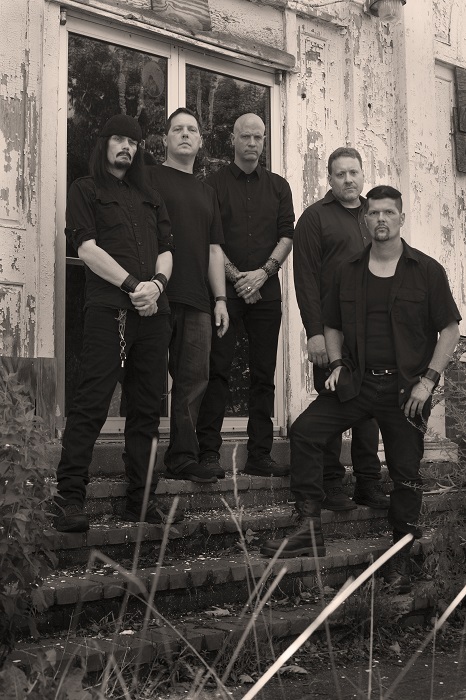 The band’s shadowy, funereal doom continues to get richer and more refined, as they’re one of the finest groups in all of doom and have been for a long time. This record lures you into the tale with their powerful pull and leaves you psychologically impacted. But lucky for you, it’s only a morbid tale. As far as you know.